My review copy: Review copy was bought by me. 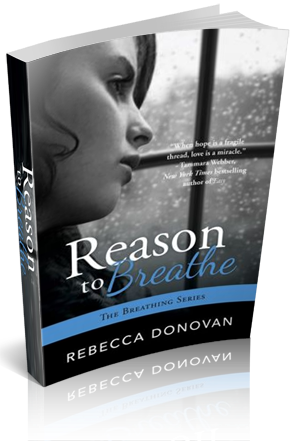 One girl’s story of unspeakable cruelty, life-changing love, and her precarious grasp of hope, Reason to Breathe is the first installment in the acclaimed Breathing Series. This novel pulled me in and played my emotions so well, and I just loved the entire experience. Rebecca Donovan was in control from the beginning in telling this story and eliciting the emotions that were drawn from me. I was happy, sad, angry, heartbroken, hopeful, anxious, afraid and emotionally drained. The writing and story were so good, but yet so devastating and sad at the same time. This is not a light read that you can just pick up at the beach. You must get involved in the plot, be invested in the characters, and realize that this book WILL take you on an emotional roller coaster ride. The characters are developed so well and are so mature that age was forgotten and the story could have been universal. I won't go into all of the details of this story because I want you to pick up this book and READ IT! Emma loved so much and was willing to endure anything to protect those that she loved. In this she was unselfish and yet this unselfish behavior was infuriating. You wanted to hug her and scream at her all at the same time. The building romance aspect of this novel was sweet and Rebecca Donovan's wonderful writing let it develop at a slow pace, so it didn't come across too rushed, although I must say, it was intense. The writing was superb from beginning to end and every chapter developed the story a little bit more. Each character was important to the storyline. As the reader, I never felt as if the author used too many characters to develop the plot. Although you could foresee aspects of the ending coming, it still left me breathless and overwhelmed. I hope that readers will feel, as I did, the need to immediately move onto "Barely Breathing" to see how the story continues.